"There's an empathy amongst those identifying as women, a desire to support the struggles of other women." Hannah Philp is a feminist activist and founder of Her Stories, a fundraising initiative, art exhibition, live auction and dinner for three charities supporting London’s most vulnerable women. Roosje Watson got the lowdown on the upcoming event. What motivated you to organise Her Stories? I wanted to raise awareness of how some of the women we share this city with live. Women who, despite their own efforts and will, do not have the opportunity or choice to escape their challenges without support. I’ve been engaged with feminist activities for several years. I set up grass roots feminist group the East London Fawcett group (‘ELF’), and I work with the 50/50 Parliament campaign for equal gender representation in the House of Commons. In these roles I’ve explored the challenges faced by women in the arts and leadership, but I wanted to do something for women who have been failed by society in some way. Why did you choose these particular charities? I had got to know the three charities personally and seen first-hand the incredible work they do. I was concerned that they cannot meet demand and don’t want to divert resources to expensive fundraising initiatives. Take for example Solace Women’s Aid. London women’s refuges are forced to turn women and children away every day, potentially to return to violent partners and the risk of being killed or seriously assaulted. There’s no excuse for that in the UK. There should be enough support and public resource to stop that happening. With Young Women’s Trust, I met one of their fundraisers at the Women’s Equality Party conference, and felt inspired to support their aim of upskilling young women, many with children, into education and employment. These women are just about surviving, and we don’t hear enough about their struggle. Up to 1 million women in the UK live in households with little or no income! I learnt about Beyond the Streets by attending one of their awareness days, which I highly recommend for better understanding the spectrum of sexual exploitation. The main takeaway is the complexity of the situation, not only of the women’s problems and reasons they are exploited, but also of the support they need to break free. The charity helps women coordinate the resources they need to change their lives; the infrastructure just doesn’t otherwise exist. An outreach worker told me she’s never met a woman who actually wanted to be on the streets, most women end up there for economic reasons. Why the art auction and live entertainment format? I liked the idea of London’s most talented artists and creative women pooling their talents to help raise awareness of other women’s stories. It also ties in with a long term interest of mine in increasing the number of female artists represented across London’s galleries. Art shapes who we are and it’s inevitable that an artist reflects their own experiences and ideas. If we just display male artists, that’s what our culture and society looks like, and women are further marginalised from the public sphere. The works weren’t created with this project in mind, they’re all very kind donations, however they are stunning pieces which help draw public attention to the appeal and the work of the charities. It’s often said that behind every great woman is a team of supporting women. Do you agree that it falls to women to ensure one another’s success? Not that it should, but it often does! Poverty and austerity are gendered in the UK, as everywhere. I and the other women involved in this campaign feel we owe it to the women at the front line of Government spending cuts to try to help where we can. There’s an empathy amongst those identifying as women, a desire to recognise and support the struggles of other women. Building a great community of women, working together to make something positive from a really negative situation, has been a wonderful consequence of this campaign. 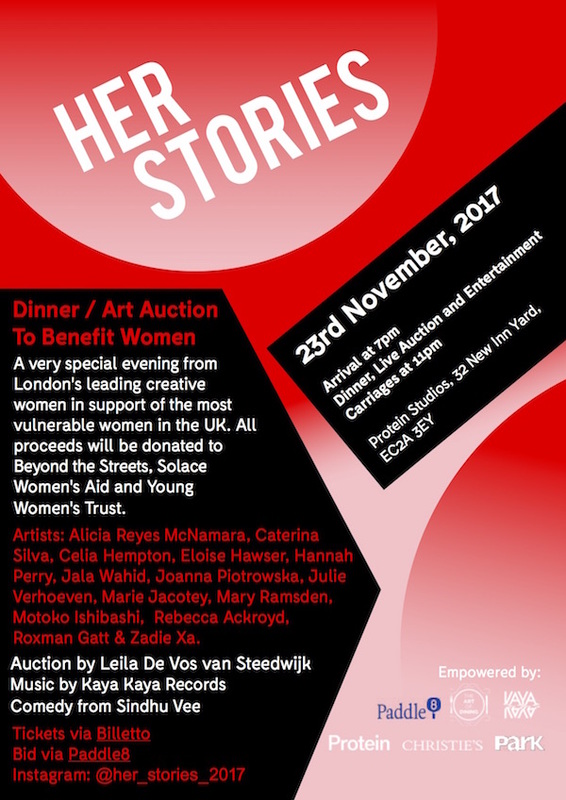 The Her Stories auction and dinner event takes place on Thursday 23rd November at Protein Studios, Shoreditch from 7 pm. A free VIP preview event will be held on Wednesday 22nd November from 6.30 pm. Tickets are available from Biletto. Work by artists Rebecca Ackroyd, Roxman Gatt, Eloise Hawser, Celia Hempton, Motoko Ishibashi, Marie Jacotey, Kate McMillan, Alicia Reyes McNamara, Hannah Perry, Joanna Piotrowska, Mary Ramsden, Caterina Silva, Julie Verhoeven, Jala Wahid and Zadie Xa will be on public display at Protein Studios until Sunday 26th November. Bids can be placed online via Paddle 8 now.